What does your face feel so numb? Hypesthesia commonly occurs due to dysfunction of the trigeminal nerve or its branches. Identify your cause and get treated early! Numbness (hypesthesia or hypoesthesia) refers to the lack of skin sensations (either partial or complete) over a part of body. Numbness usually signifies nerve dysfunction but can occur in certain defects in the central nervous system (brain and spinal cord). It is also frequently associated with paraesthesias (pins and needles sensation, tingling, etc.). Numbness in face can occur with the damage or dysfunction of the branches of the cranial nerve supplying the face region (trigeminal nerve). Less commonly, it can be due to certain brain dysfunctions or can be psychogenic. Dysfunction of the facial nerve (as in Bell's Palsy) will usually not cause numbness as it carries innervations for the muscles of the face and not sensations from the skin. Read the contents in the following table to know many causes of this condition. Peripheral nerve dysfunctions (trigeminal nerve in this case) can occur due to variety of reasons. Most common causes are vitamin deficiency, diabetes mellitus, excessive alcohol intake, lead poisoning. There are myriad other causes of peripheral neuropathy. Electrolyte Imbalances (abnormal blood levels of calcium or potassium or sodium) can also result in nerve dysfunction. Autoimmune damage to outer protective covering of the nerves (myelin sheath) results in multiple sclerosis. Symptoms are highly variable depending upon the segment of nervous system involved. MS afflicting trigeminal nerve or brain regions handling facial sensations can result in numbness of the face. Injury to the various branches of the trigeminal nerve can cause facial numbness. Usually, when only a specific branch is injured, the area of numbness is confined to the region of the face innervated by that branch. Nerve injury can occur due to trauma or sleeping in awkward position (resulting in prolonged compression of the nerve). The aural phase and/or the prodromal phase of the migraine can have numbness in face as one of the symptoms. Less commonly, facial numbness can persist or occur exclusively during the headache phase. TIA or "mini-stroke" occurs when blood flow to a part of brain is interrupted for a short period of time. TIA can present with variety of symptoms depending upon which part of the brain is affected. TIA involving the region of brain handling facial sensations can result in brief period of facial numbness. Often, other symptoms are also present. Usually there is full recovery after an attack with no neurological deficit or brain damage. However, TIAs are warning signs of an impending stroke that may occur anytime. Stroke can result in facial numbness. However, other more severe symptoms like paralysis, or altered consciousness, etc. dominate the presentation of the stroke. Brain tumors can result in facial numbness. 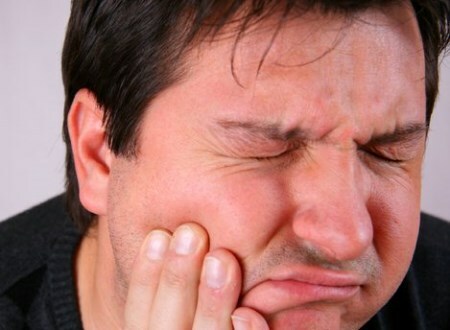 Numbness is confined to chin region. A "seizure" occurring in the trigeminal nerve. Rarely trigeminal neuralgia can result in numbness in face. However, facial numbness preceding the intense pain is more likely to occur. Shingles or herpes zoster can rarely have facial numbness in the prodromal phase (i.e. before the appearance of painful skin blisters). However, more commonly pain and paraesthesias occur in the prodromal phase. Trigeminal nerve (including branches) tumors (e.g. Schwannomas) or invasion of the nerve by nearby tumor (e.g. Meningioma) can result in facial numbness. Seizures confined to areas of the brain handling facial sensation can result in facial numbness. Facial numbness can occur in hypothyroidism. Other symptoms of hypothyroidism will dominate the presentation. Stress, depression and panic attacks can result in facial numbness. Sometimes no cause can be found even after thorough neurological evaluation. Such cases are referred to as idiopathic cases. So if you or someone you know have symptoms of facial numbness, it is strongly advised to consult a doctor to rule out the reasons for better and early treatments. Mild Concussion: Symptoms, Treatments and More! What Are the Early Symptoms of Dementia?